Hey readers, I’m back! Did you miss me? Sorry about being MIA for a while, but Ash and I were on a much-needed vacation, which I will be writing about later this week. I wanted to pop on and post a quick follow-up to a post I wrote in mid-September. You can read it here. If you recall, the federal Transpiration Enhancement program was in danger of being cut, but it was saved by the House… Now, it is in danger in the Senate, and Preservationists need to act swiftly to save one of our biggest sources of funding and YOU can help! Just take a moment to click this link, read the Preservation Nation article and click their link so that you can contact your Senator and tell him or her to save the Transportation Enhancement Act and ditch the bad language. Don’t forget to come back on Friday for our Fantasy. Thanks for doing your part for Preservation, and have a great day! Score one for the Preservationists! It’s been a good day today. The Transportation Enhancement program will be sticking around for another six months thanks to the Senate. I thought I’d share photos of these beautiful transportation resources in celebration. 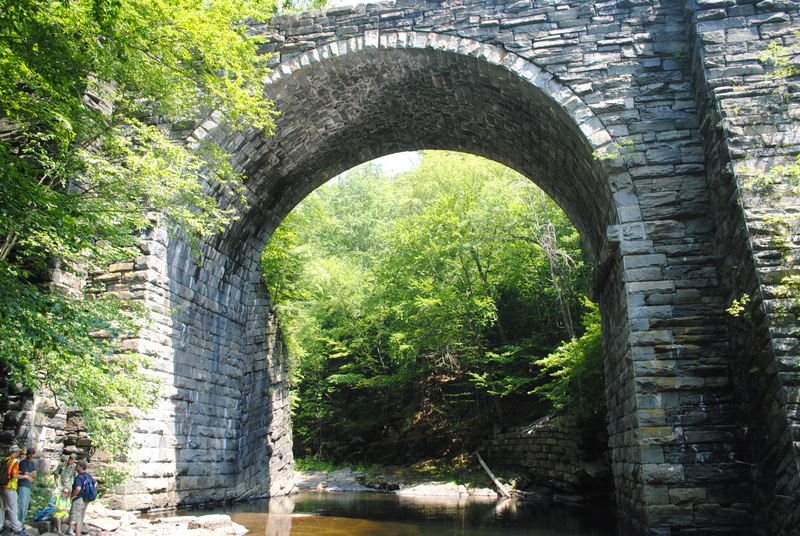 The Keystone Arch bridges in Middlefield, Massachusetts are remarkable, entirely dry-laid stone edifices built to carry the Western Railroad over the Westfield River. These soaring arches were constructed in 1840 and carried rail traffic for over 100 years. 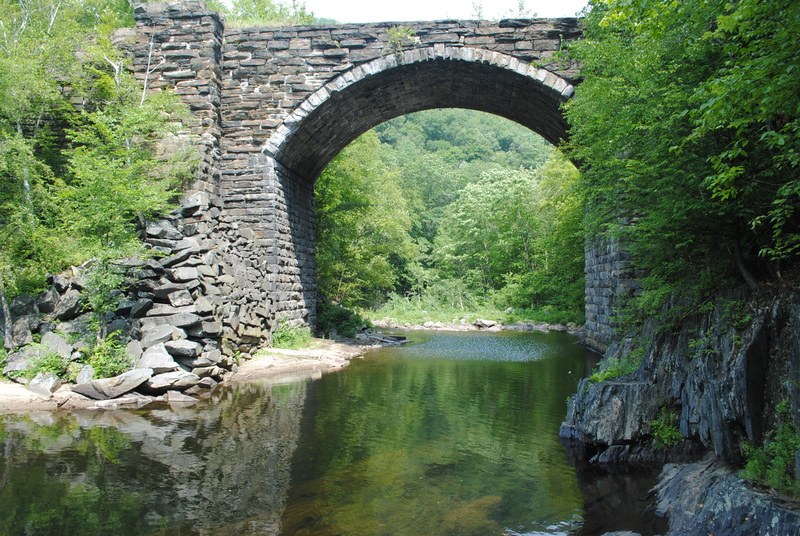 Today, they stand sentinel over Massachusetts’ first-designated Wild and Scenic River on a bypassed section of the original 1840 railroad grade, which serves as an unbelievable trail for viewing the splendor of nature and man-made marvels side-by-side. Providing access to natural and architectural treasures like these is what the Transportation Enhancements program is all about, and it can continue to bring the American public closer to our vast and unique country as long as we continue to support it. This post is a quick PSA. For more information and a handy link to email your Senator, please visit this Preservation Nation Blog. With so few jobs in our relatively small field, and with museums and historic interest groups reeling from the recent loss of funding to programs like Save America’s Treasures, the Preservation field desperately needs to save what little Federal funding remains, to keep professionals at work. In a field that has been working over the past 40-plus years to gain the trust and assistance of state and local officials and the general public, working to ensure the preservation of our national, regional and local identity, and striving to be seen as more than the group of crazed anti-progress zealots often referred to as the “hysterical society”, we need all of the professional guidance and funding available. Don’t get me wrong, volunteers are wonderful people and can often be the difference between a Preservation project succeeding or languishing indefinitely, but Preservation in this country can’t be accomplished by volunteers alone, and the sort of funding that keeps people in our field working is disappearing rapidly! So, please get in touch with your Senator and let them know that the Transportation Enhancement Program is one that our country needs! Tropical Storm Irene is over and Ash and I came out of it relatively well, with just a few downed branches. Everyone we know is safe and sound, and that is the important part (though my prayers go out to the families that did lose loved ones). Today’s post will be very quick, as things are in disaster recovery mode here at Old Stuff, Inc., which coincides with tax credit submissions this time around, so things are hectic here to say the least! I wanted to take a moment to put the spotlight on Vermont. Vermont suffered worse than any other New England state due to extreme flooding from the storm, and there are some towns that are still underwater, or cut off from everything because of damaged roads and bridges! I’d like to give a quick shout out to blogger (Kaitlin) at Preservation in Pink and many of my Preservation School classmates up there who are based out of Vermont. I was glad to hear that everyone was safe, but I know they have a lot of dehumidifying to do and river sludge to clean up. Good luck with the long recovery process, you guys! You’re in my thoughts. I’d also like to ask any of my readers out there to give a hand to the good people of Vermont if they are able. I know that any kind of support will be well appreciated. 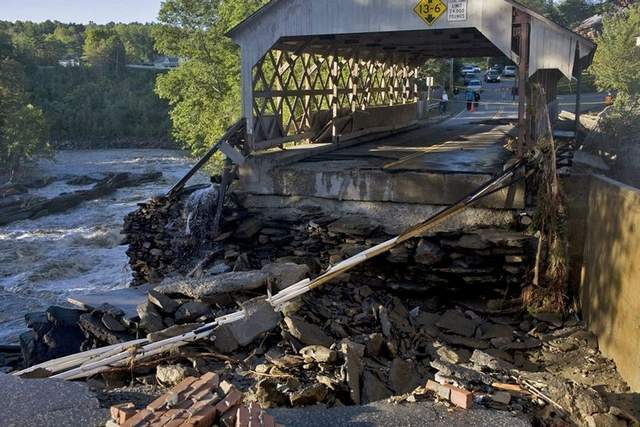 Oh and here is a link to an article on the damage sustained by Vermont’s covered bridges in the Burlington Free Press (where the picture above came from). Stay dry and be safe, Vermonters and everyone else in states that saw damage from Irene! If you were lucky to come out unscathed, like Ash and I, please try to help out in any way that you can!